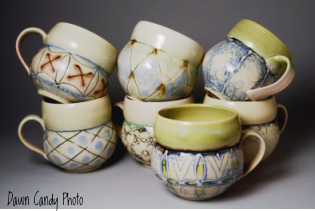 A collection of hand made pottery mugs thrown and decorated by Central Alberta artisan, Dawn Candy. When one of the potter's that I represent in my gallery gets out of bed in the morning it's with the intention of making dozens of beautiful mugs to sell so that she can pay the rent, put food on the table, keep the lights on, cloth herself and her children and keep the ten year old car operational until her ship comes in. In short...she has to make a living wage. But before she pays her personal expenses she has to ensure she has a place to work. That means she has to pay the rent, keep the lights on and the furnace operational in a studio space that also has to be furnished with the appropriate equipment and shelving needed by a production potter. And also before she takes a salary she has to travel to the city to buy clay...usually twenty 40 pound boxes at a time...haul it home, pack it into the studio then one box at a time cut and wedge the clay in preparation for throwing. When its finally time to begin throwing the mugs...dozens at a time... they have to be placed on ware boards and left to air dry slowly in a special drying room. And don't forget the handles! More clay has to be processed, extruded or hand-formed into handles, air dried and eventually attached to the mugs...which involves another trip to the wheel, a wire brush, a signature and another extended sojourn in the drying room. Eventually, when the potter has assembled enough work to fill the kiln, the mugs are bisque fired, cooled and returned to the studio in preparation for glazing and decorating. Glazing is both an art and a science. Glaze is not paint...it's glass...and the coefficients of clay and glass are different so the glaze has to be engineered to "fit" the mugs or it may shiver and ruin the production. 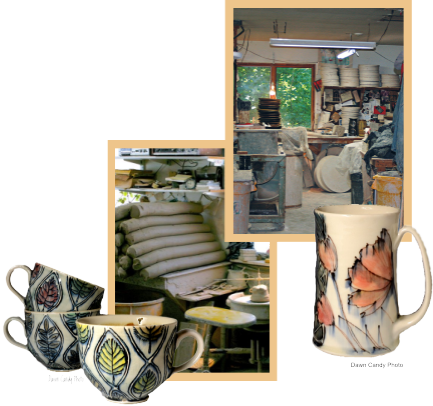 Most potters create their own glazes, a process using chemistry and experimentation. The ingredients for glazes (minerals and oxides) are also another expense, sometimes a pretty hefty one! Imagine painters making their own canvases and paints from scratch before they even start on a piece. This whole process of glazing handmade pottery mugs I've collapsed into one little paragraph but glazing is an incredibly complicated process which can involve many steps and many firings. When there's enough mugs glazed to fill a kiln they're loaded and fired to a temperature of 2380 degrees Fahrenheit...a twelve to fourteen hour process (and you think YOU have a big light bill) then cooled for two days. As much effort and expense goes into marketing handmade pottery mugs as there is in making them. But then the chubby little vessels have to go to the sanding area where the bottoms are power sanded so they don't scratch expensive table tops. You'd think the potter could now pay herself...but not yet! Next she has to find a buyer . . . this is called marketing and involves creating price lists, websites, email lists, brochures, direct mail packages, communicating with galleries that will represent her work and paying booth fees at craft shows. And for your information, Toronto's One of a Kind Show charges $14,000 for a 10x10 booth for the ten day show!! Plus travel, accommodation and food, of course. The lady gets paid when she makes a sale.